Yabby Lake came highly recommended from the folk at the Merricks General Wine Store. 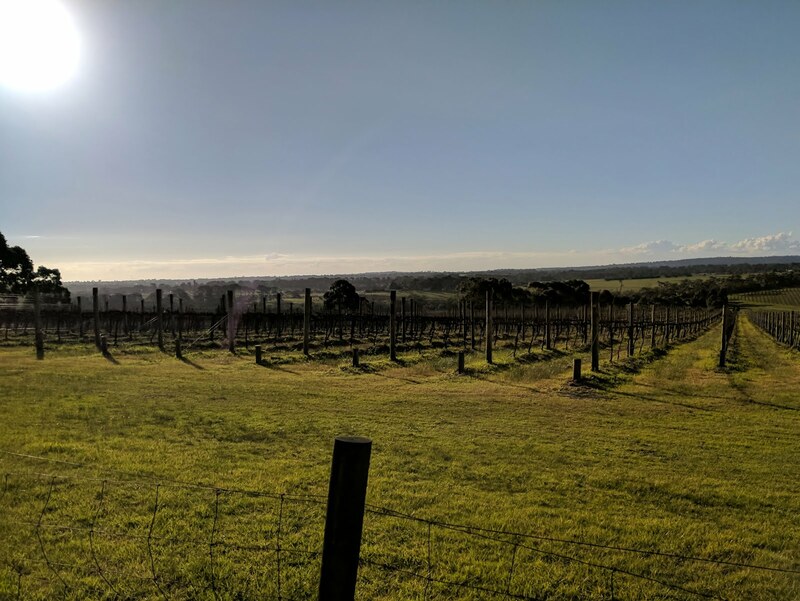 Situated as one of the most northern wineres in the Mornington region, it makes an ideal final stop on the way back to Melbourne. The winery is Halliday 5 star, it produces some serious wines sourced from both its Mornington and Heathcote vineyards. There are plenty of standouts, the Yabby Lake Pinot Gris and the Syrah both stood out along with their Pinot Noir's. The restaurant is a casual style affair with great views across the vineyards and plenty of light and space. Looking over the menu, the cassoulet was the obvious choice. served with generous chunks of pork belly, cured ham, Toulouse sausage and a confit duck leg, there is plenty to satisfy a carnivore. Served with a green salad, it is plenty for two. Overall the cassoulet was well balanced, the bean filling was rich, but not too heavy on tomato. The parmesan and bread crumb topping was icing on the cake. Pairing the cassoulet was the Yabby Lake 2016 Block 6 Pinot Noir. This is an exceptional Pinot, good enough for 97 points from Halliday. The great thing about a cellar door restaurant is the markup in the restaurant in almost nought. In addition to this, they allow you to take home anything left over so it really encourages one to let loose on a special red, but not feel obliged to complete the whole thing. 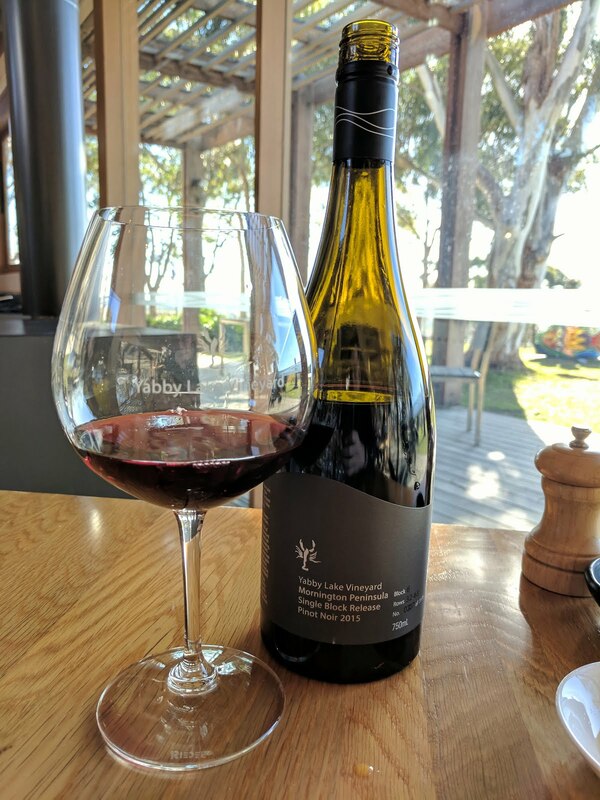 Yabby Lake is well worth a visit for both the wine and the restaurant. Winning on both fronts. Not that anyone really needed convincing, but American BBQ is the Mexican of 2015. The slow burn of places like Big Boy BBQ and Meat Maiden/Mother has led to "convenience" or fast food BBQ (now there is a contradiction). Smokestak with the stylized smoker/pig/bull logo is up against if for location. Not really that well placed but makes the most of what little space is there. There are assorted sandwhiches and ribs available and being a sucker for ribs asked for a mix of the pork and beef ribs. The ribs were promptly served with a nice glaze of bbq sauce and crunchy fries. The pork ribs were well cooked and came straight off the bone. They were perhaps a tad hammy from the smoking process and a little less moist due to being cut in to individual portions rather than a rack. The beef ribs were a bit more moist but not as flavoursome as the pork. My biggest complaint would be a lack of refresher towlettes, ribs are a risky proposition at best in work attire and keeping oneself clean requires careful management. The two staffmembers and I had a chat, Smokestak has been open 3 months and without a web site, twitter or instagram, it's biggest failing is probably with social media, or perhaps that is the aim - focus on food rather than twitterverse. For now, I would say it is worth a visit, i'll probably return before a definitive view, but it is certainly a place I want to succeed. Now just give me a whole rack of ribs! 8:00pm at Victoria Gardens on a Wednesday night is not peak time for dining options. In fact the only option is Cafe Krifi at the Hoyts escalator. Not exactly my first choice, but really only choice. Resigned to being the only choice I went in to take a look at the menu. After three goes to get a beer that was available I wasn't holding out much hope, but decided to give the #1 Deli burger a go. Overall the burger was well cooked and well presented. The meat was well seasoned and moist, everything in there was cooked with the only gripe being the tomato was a bit thick. The chips were well cooked, crunchy and hot. Considering it was the last chance saloon, it paid off. There is also the added bonus of all meals over $10 can buy a discounted movie ticket. Another bonus! Value can be viewed two ways, one ways is getting something good for less. The second is getting something better for the same price, but not necessarily good. The latter statement is my view of of Ikyu Sushi. I ended up at Ikyu after learning that Paco Tacos is only open on Fridays in winter. After mulling over my options, $8.90 katsudon seemed like a good deal. Katsudon is a nice wintry dish that I interpret as the Japanese equivalent of a chicken parma, except with pork schnitzel and on rice. Anyway, the bowl arrived promptly and the cutlet was quite nice, crispy and not grisly. The egg was on the side, not on the cutlet and the onion was raw. It seemed more of a "my take on katsudon" rather than an actual katsudon. The omellete was too thick and there was not enough sauce to give flavour to the generous bowl of rice. So Ikyu is good value for $8.90 compared to similar cafes selling a sandwich, but it is not a good value katsudon, it is a pretty inferior knock off that I wouldn't return for. 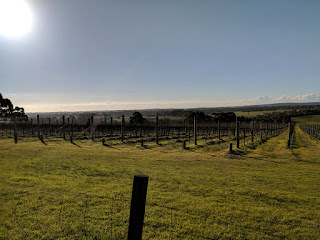 Port Phillip Estate is a magnificent location, it's hard not to be taken in by the views across the vineyard and out to the sea. 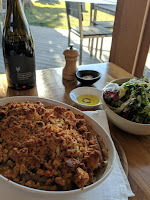 Luckily though, the wonderful food and wine on offer is able to well and truly match the stunning views.The wines of Port Phillip Estate and Kooyong are well recognised as leading producers of pinot noir. 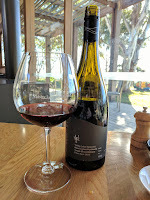 The Ferrous pinot noir rates as consistently one of my favourite pinot's and given that it was also the James Halliday winery of the year 2012, a few others would agree with that comment.To match the wines, the cellar door also features a fine dining restaurant with options of 2 or 3 courses. The choice of starters was very easy, the Risotto Blanco with Jamon, egg and truffle could feature as a line in My Favourite Things. Combined, the dish set a very high benchmark, the rice was a unusual for a risotto as the husk was still on the rice making for a very nutty risotto. The 62 degree egg added a nice creaminess to the dish and well the truffle just did what truffle does, make everything awesome. Next course of Saskia Beer Pheasant, Petits Pois à La Française, pomme gaufrette was also a sold dish. Not quite matching the highs of the starter and with some of the Pheasant close to overcooked, it did feature a number of flavours and textures. It was a good dish to pair with the Kooyong Ferrous 2012 Pinot Noir. The dessert of chocolate mousse, banana, salted caramel was not quite what I expected, a creamy mouse with cubes of banana bread small chunks of chocolate and salted caramel sauce was nice but almost too much of a sugar overload. I would have also liked mousse to be a bit firmer and more aerated. Overall, Port Phillip Estate is a great spot for a lazy afternoon lunch to enjoy the views, the wine, great food and friendly service. I am sure that was the intent behind the investment and it delivers well. The Italian food renaissance of Melbourne continues. It seems like there is a great Italian restaurant opening every week. In recent times I have been a regular of Sarti and Fatto, but when I heard of Tipo 00, it moved quickly up the must try list. Decked out with a modern interior, Tipo 00 is very inviting but can be a bit noisy once it fills up. The menu is all round very appealing and the $55 chef menu is a tough one to turn down as are the carafes of local and imported reds. Our pasta dishes included the Tagliolini al nero which is reminiscent of the squid ink dish at Sarti. Flavour wise it was good, but the pasta had a slightly floury texture. The best was saved for last, Gnocchi di patate. super pillowy gnocchi with a rich duck/mushroom braise. Time was starting to get away from us, but there was just enough time for desert and thankfully we committed to it, The Tipomisu is an epic affair, rich, creamy with a decadent caramel/coffee/salt sauce. Worth coming back for this alone. Tipo 00 is a veritable bargain at $55 for the chefs menu. Excellent food, wine and service. I may have found a new Italian favourite. The once bleak level crossing of North Rd Ormond has been experiencing a culinary renaissance. 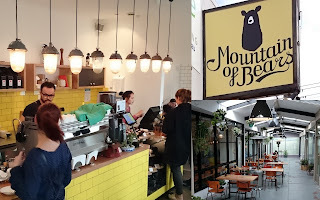 It seems that with the opening of Jimmy Grants by George Colombaris, it's now acceptable to operate an establishment with a pinch of "North of the Yarra" style among the Subway's and KFC's of the proliferating in the area. Mountain of Bears, with its cryptic name and hidden location should be a recipe for disaster. 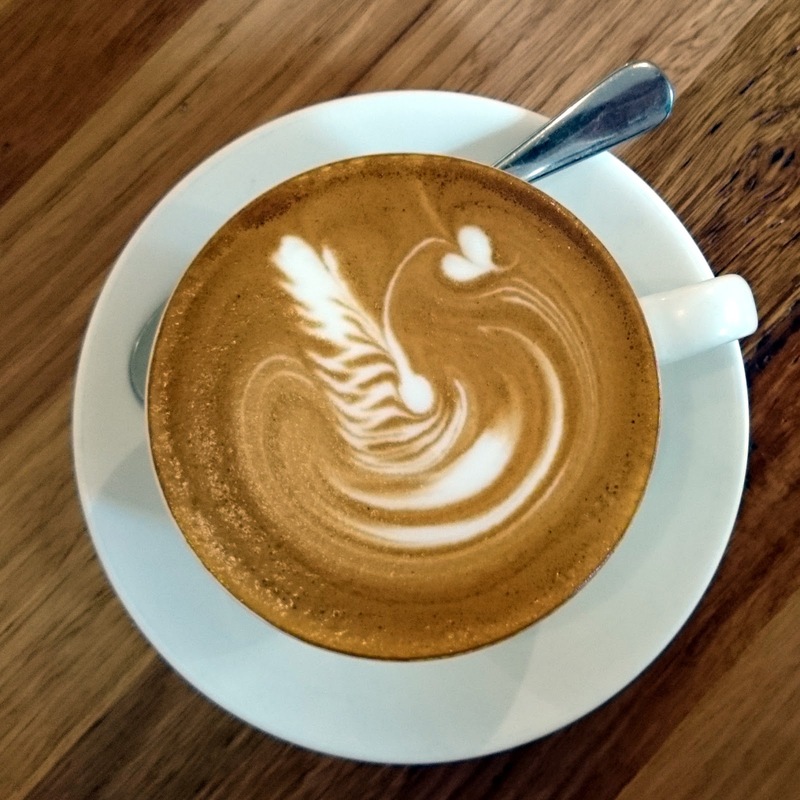 However, serving excellent coffee and generous food seems to make up for the disadvantage. Started up by folks from Manchester Press and Cafe Loco, it is unsurprising that the coffee is excellent. It certainly rates as one of the prettier flat whites I've had in a while too with some very crafty latte art. Food favours the all day breakfast menu with non breakfast leaning on a range of bagels. As is the trend of the past 12-18 months, one of the fillings is pulled "something", in this case pork. 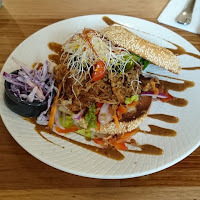 The serving is very generous, with lots of pickled and crunchy textures to break things up. The only criticism would be the sauce zig zagged over the bottom of the plate. Unless it is drizzled in an "it's so outdated we're being ironic" effort, it looks a bit naff and also makes it impossible should you wish to try and enjoy the bagel as a bagel rather than an open bagel sandwich.